As the manufacturer's first foray into the digital medium format arena, the Pentax 645D brings plenty of appealing features to the game, including a 40MP, 44 x 33mm, Kodak-developed CCD sensor that's designed to deliver professional image quality exceeding that of a 35mm full-frame DSLR. With a nod to Pentax's original medium format film 645 camera system, the new digital SLR version looks and feels every bit as solid as its well-respected 1980s-born ancestor, sporting a similarly intuitive design. Despite its retro looks, however, the Pentax 645D is equipped with a whole host of up-to-date photography technologies and plenty of advanced functionality: all in an easy-to-use package. The Pentax 645D has an RRP of £8999.99 for the camera body alone, or just shy of £10,000 to buy it along with the brand new D-FA 645 55mm f/2.8 AF (IF) SDM AW lens. The camera certainly represents a sizeable investment then, yet is still a lot cheaper than medium format digital camera rivals such as the Leica S2. So what do you get for your cash? With prestigious brands such as Hasselblad, Phase One and Leaf heading up the medium format digital camera market, the Pentax 645D is up against some stiff competition. But Pentax hasn't been deterred from taking on the big boys - both in terms of the technology it has to offer and the price. 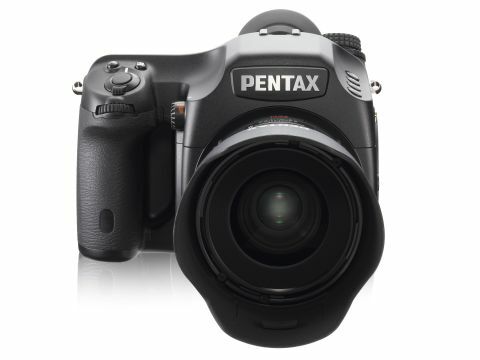 Although perhaps still out of the budget range of many professional photographers looking for a product to give them the best image quality they can afford, the Pentax 645D currently represents the most affordable option in the digital medium format market, undercutting its competitors, such as the £21,000 Leica S2, by a fairly significant amount. The Pentax 645D's headline feature is its 40MP CCD sensor: measuring 44 x 33mm, images reach a top resolution of 7264 x 5440 pixels, giving plenty of scope for some pretty severe cropping if necessary, as well as extremely high-quality large format printing options. There's also a high resolution, 921,000-dot TFT LCD screen that sports a reinforced glass upper surface, wide viewing angle and effective anti-reflective coating that makes it highly usable. The clear display and 32x image magnification capability make it easy to check images for accurate focusing and sharpness - a vast improvement over some of the comparatively poor-quality screens we've experienced on other digital medium format rivals. Other notable features include an 11-point SAFOX IX+ AF system, 77-segment metering system, a crystal clear, all glass, trapezoid pentaprism viewfinder and Pentax's Prime II imaging processor. Plus useful extras include a digital spirit level, automatic lens correction, dust removal, dual SD card slots, 14 Bit raw file support in PEF and Adobe DNG formats, HDMI output and in-camera HDR processing. The Pentax 645D's comprehensive set of technologies make it well equipped to deal with a good range of photographic situations.